Henry Louis Gehrig was destined to be a New York Yankee. Born in New York City in 1903 in the Yorkville neighborhood of Manhattan, Gehrig would parlay his athletic talents of football and baseball at PS 132 in Washington Heights and later Commerce High School in New York City into an athletic career at Columbia University. After sitting out his Freshman season (due to ineligibility after being discovered for playing with the Hartford Senators of the Eastern League in 1921), Gehrig returned to both football and baseball for his Sophomore season at Columbia. Gehrig was a fullback on the Columbia football team, but his prowess on the baseball diamond is what caught the scouts’ attention. In a stroke of historical irony, while Yankee Stadium was opening on April 18th, 1923, across town Gehrig was striking out 17 Williams College batters. All of this was in front of Yankees’ scout Paul Krichell, who had his eye on Gehrig for some time. Krichell was more impressed with Gehrig’s bat as opposed to his arm as Gehrig had hit some of the longest home runs seen on the college field. It was not long that Gehrig was offered a Yankees’ contract and the future Iron Man signed with the Yankees on April 30th of 1923. For two seasons, Gehrig played mostly in Hartford for the Senators, only getting a few games in with the big club, but he did make his Yankee-debut on June 15th, 1923 at the age of 19. Gehrig was assigned the number 4 for his number in the batting order, behind none other than Babe Ruth. Gehrig was sent up as a pinch hitter for short stop Paul “Pee Wee” Wanninger during the June 1st, 1925 game. In what may be the managerial stroke of genius of all-time, Yankees skipper Miller Huggins penciled Gehrig’s name in the lineup over regular first baseman Wally Pipp, who was battling a severe slump. 14 years and 2,130 consecutive games later, Gehrig would finish off one of the great careers in baseball history – amassing 493 home runs, 1,995 RBI a then-record 23 grand slams, six World Series titles and two American League MVP’s – earning a special Hall of Fame induction in 1939. Despite the impressive numbers and team accomplishments, Gehrig’s career and life were sadly cut short by the debilitating disease Amyotrophic Lateral Sclerosis, which is commonly known as “Lou Gehrig’s Disease”. It was this disease that stopped his then record-breaking consecutive games streak at 2,130 in 1939 – 14 years after the streak started in 1925 – his first full season in the majors and took his life in 1941. Goldin Auctions is proud to present the very 1925 Uniform Players Contract signed by Lou Gehrig for the upcoming 1925 season. 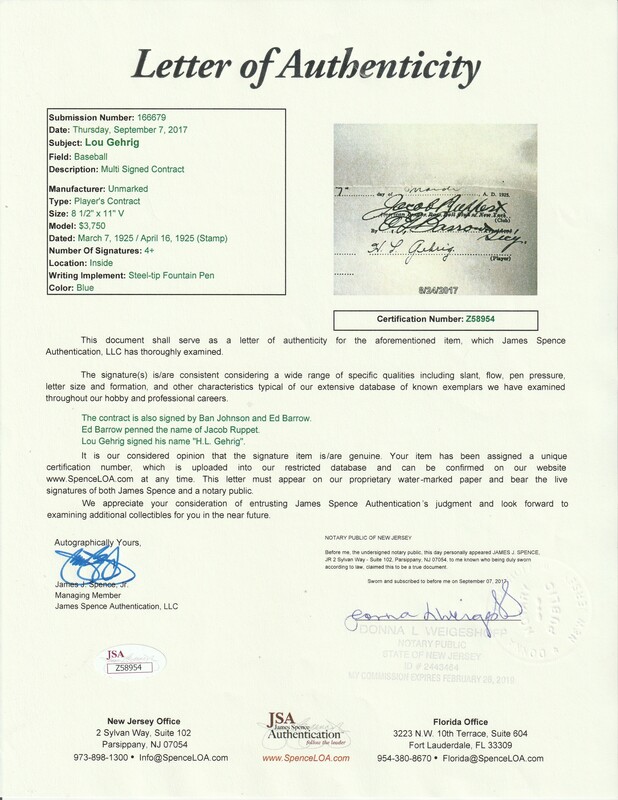 This is the very document that tied Gehrig to the New York Yankees for the 1925 season. Gehrig’s salary for 1925 was $3,750.00 which equates to roughly $54,500 in today’s money. 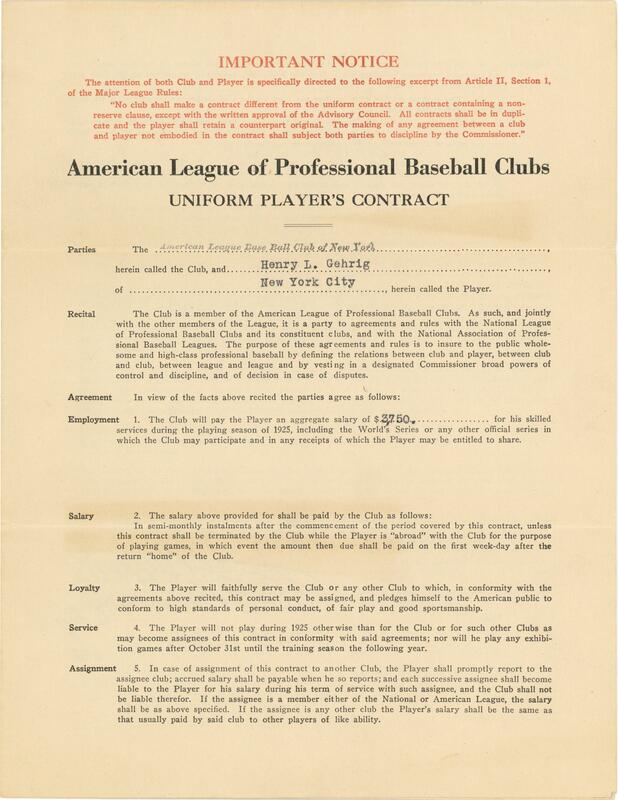 This incredible 4-page 8 ½ x 11-inch contract has “American League of Professional Baseball Clubs UNIFORM PLAYER’S CONTRACT” printed on the top portion of the first page with “The American League Base Ball Club of New York herein called the Club, and “Henry L. Gehrig New York City herein called the Player” listed below. The second page contains the handwritten “7th” day of (printed) “March” A.D. 1925 (printed) and the key signatures of American League President Ed Barrow and Lou Gehrig, who signed his name “H.L. Gehrig”. The signature of Yankee’s owner Jacob Ruppert was penned in the hand of Ed Barrow. All of the signatures have been signed in black steel-tipped Fountain Pen and display boldly on the page. 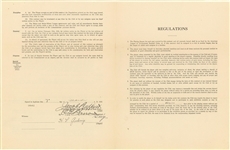 The third page includes the “REGULATIONS” while the final page has “Gehrig-1925” handwritten on the top left corner with “AMERICAN LEAGUE PLAYER’S CONTRACT” printed boldly across the top. 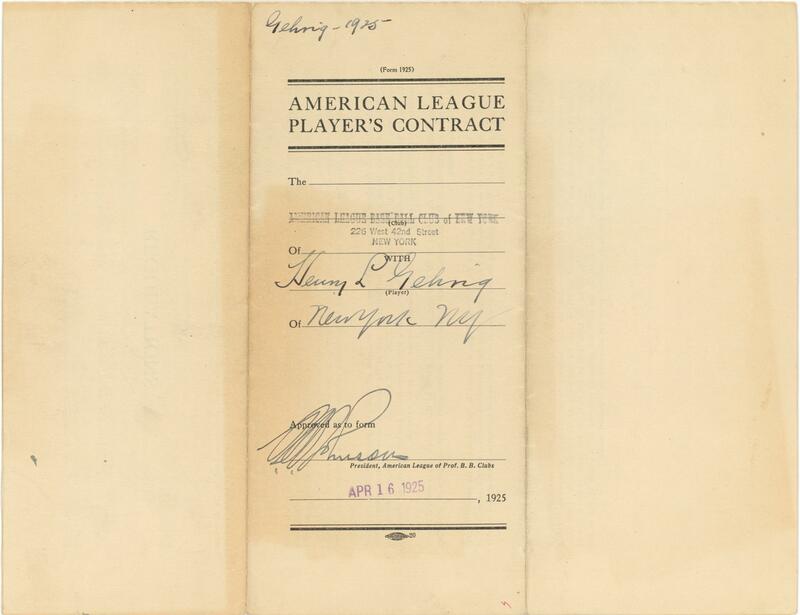 “Henry L. Gehrig” Of “New York NY” is handwritten on the pre-printed player line with Ban Johnson’s signature in black at the bottom and an “APR 16 1925” stamp in purple. 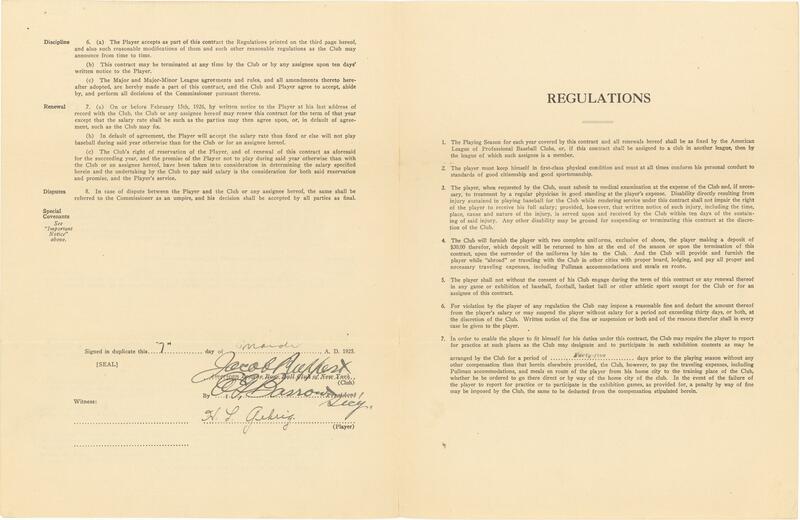 For a nearly 100-year-old contract, this document is in excellent condition and displays the common tri-fold associated with contracts of that day that were mailed to the American League offices. Each page displays varying degrees of toning, staining and edge wear, but the print and the signatures are still in mint condition. Gehrig’s first contract (1924) sold for $480,000 in 2017 and this contract is equally historic given the 1925 contract offered here was for the season that started the historic streak. 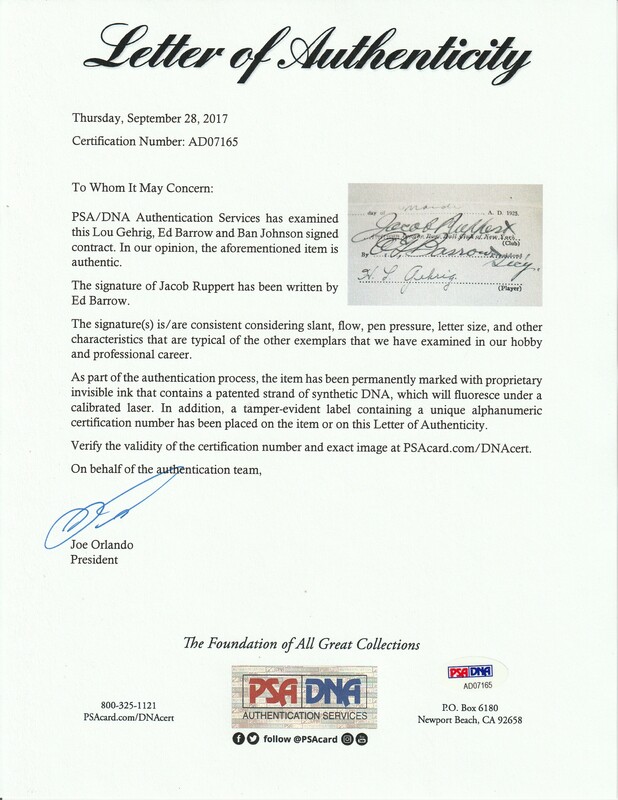 This contract comes fully authenticated with LOAs from both PSA/DNA (AD07165) and JSA (Z58954), with both authenticators noting that Jacob Ruppert’s signature was penned by Ed Barrow. 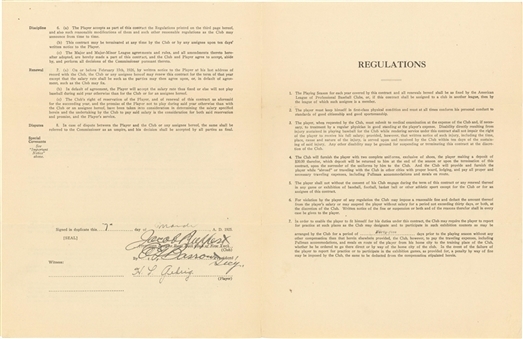 A wonderful opportunity to own a truly historic baseball contract from baseball’s Iron Horse!